Every tourist who visits Pisa, Italy, returns with a photo pretending to hold up the city’s famous bell tower, the Leaning Tower of Pisa. Creating the photo illusion is so popular, that hoards of tourists flock to the town for the sole purpose of snapping the picture. One visitor, however, took it upon himself to walk around the square surrounding the tower and prank unsuspecting tourists. While they stood with arms outstretched, he snuck in, doling out one high-five after another. Watch above to see their surprised reactions. Wouldn’t you know it, someone else happens to be taking that cheesy staged photo in the same spot that you’re trying to take it. In fact, it’s happening all over. Germany and Switzerland have long been known as bastions of cool efficiency, where the trains run on time, locals scold visitors for jaywalking and everything works. But travelers might be surprised to know that these countries are also home to four of the world’s most crooked towers, all of which lean more dramatically than the much more famous Leaning Tower of Pisa in Italy. Wessels recently told Der Spiegel that the church now receives about 10,000 visitors per year. 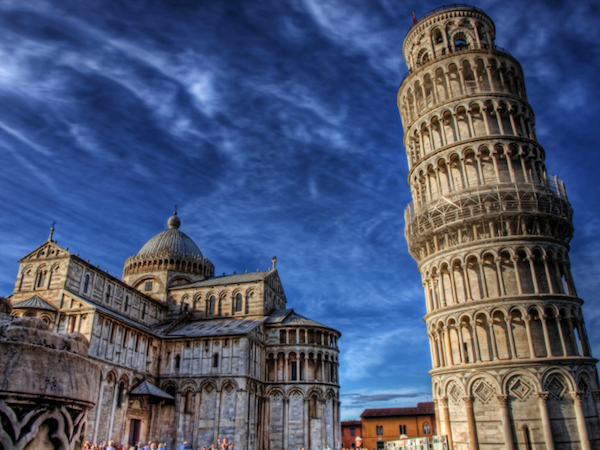 Not bad, but still quite modest compared to the 426,000 tourists who visited the Leaning Tower of Pisa last year, according to a tourism official quoted in The New York Times. But a number of other leaning towers have emerged in the wake of Suurhusen’s crooked anointment. A medieval defense tower in Dausenau, in the German state of Rhineland-Palatinate, claimed a slightly greater tilt at 5.24 degrees, compared to 5.19 for Suurhusen, but Guinness rejected the bid because the tower is a crumbling ruin, not a functional, freestanding structure. A 12th century tower in St. Moritz, the tony Swiss ski resort, might have laid claim to the record, but a recent stabilization project reduced St. Mauritius’ slant from 5.4 degrees to 5.08. Meanwhile, a 174 foot tall church bell tower in Bad Frankenhausen, a spa town in the eastern German state of Thuringia, has its own claim. The degree measurement of its slant is more modest than that of Suurhusen’s, but because its tower is nearly twice as tall, its total margin of deviation makes it appear even more crooked.Confused? Just wait. A steeple in Midum, a town near Suurhusen in the German region of East Frisia, claims its tilt is a whopping 6.74 degrees. But church leader Udo Aalderks hasn’t gotten around to making the claim with Guinness yet and it’s unclear if it would dislodge Suurhusen anyway, because the church in Midum is only 46 feet high. An expert told Der Speigel that some 70% of the medieval churches of East Frisia are hopelessly tilted. Experts say this is because the region is “low-lying and marshy.” Many of the structures were built on wooden supports which are now rotting. Restoration is extremely expensive and the tower in Bad Frankenhausen is due for at least partial demolition unless the town can figure out how to pay for the needed repairs. If you’re a crooked building aficionado, you might also check out the Leaning Tower of Pisa replica on Touhy Ave in Niles, near Chicago; the Crooked House in Sopot, Poland, and the Errante Guest House in Chile, to name just a few sloping beauties. And there is also the Crooked Road, Southwest Virginia’s 253-mile heritage music trail. Gallery images via Wikimedia Commons, and Hippygit, Jaseman, and HarshLight on Flickr. There’s nothing wrong, per se, with taking cheesie vacation photos. They make you laugh, they help you remember trips and they became cliche only because so many people enjoyed taking them. We stick our heads through wooden cutouts so that we have cartoon bodies. We pretend to hold the Taj Mahal in the palms of our hands. What we all probably fail to realize is how we look to everyone else while we’re taking those pictures. This fantastic shot by Flickr user Flavio@Flickr shows what a gaggle of people pretending to hold up the Leaning Tower of Pisa look like to the rest of us. Without the tower in proper context, it looks like a bunch of tourists doing the Thriller dance in an arbitrarily chosen location. There’s nothing wrong with that, of course. They all took home photos that made them laugh. And we can all laugh at them. It’s a win-win, really. Have a picture of tourists taking pictures? Or just some great travel photos? Submit your images to Gadling’s Flickr group and we might use one for a future Photo of the Day.